Happy Monday, blog fans! How were your weekends? Mine was especially great, as I got my new kitten Bertie! We've spent the past few days getting to know each each other and she is currently fighting off sleep watching me type. Back to business though... We're starting things off with a bit of skincare, more specifically the upcoming August Pearlesque Box. 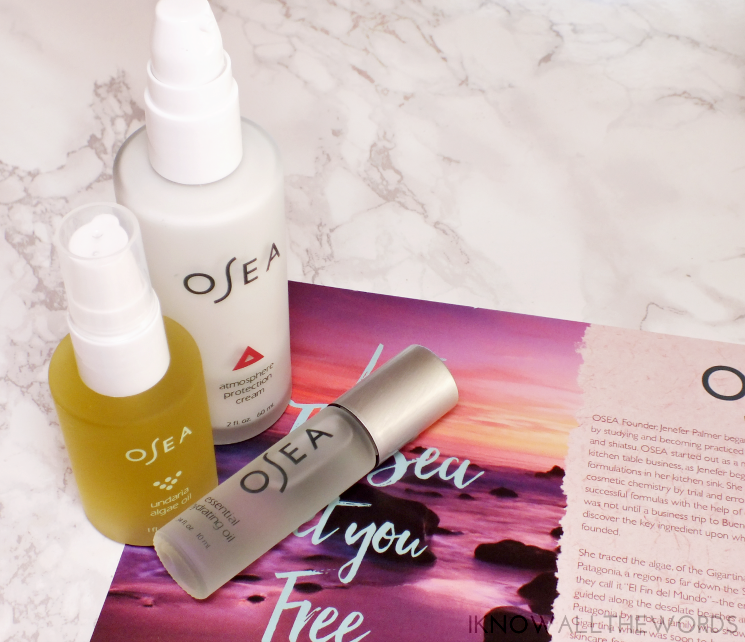 The August box features the brand Osea, which I've wanted to try for.. Quite a while. The brand has actually already been featured in a previous Pearlesque Box, but was so popular they've brought it back, which must be a good sign, right? "Osea started out as more of a kitchen sink than a kitchen table business, as founder Jenefer Palmer began experimenting with skincare formulations in her kitchen sink. She became fluent in the basics of cosmetic chemistry by trial and error, later reformulating her most successful formulas with the help of cosmetic chemists. However, it was not until a business trip to Buenos Aires that Jenefer would discover the key ingredient upon whihc her skincare line was to be founded. She traced the algae, of the Gigartina species, t the coast of Patagonia, a region so far down the South American continent that they call it "el fin de mundo" - the end of the world. There, she harvested the Gigartina, the key ingredeint of her skincare formulations. Through Osea's evolution, Jenefer has ensured that the brand stays true to its initial commitment : to provide the highest quality, ecologically-responsible natural skincare to ingredient-conscious consumers. 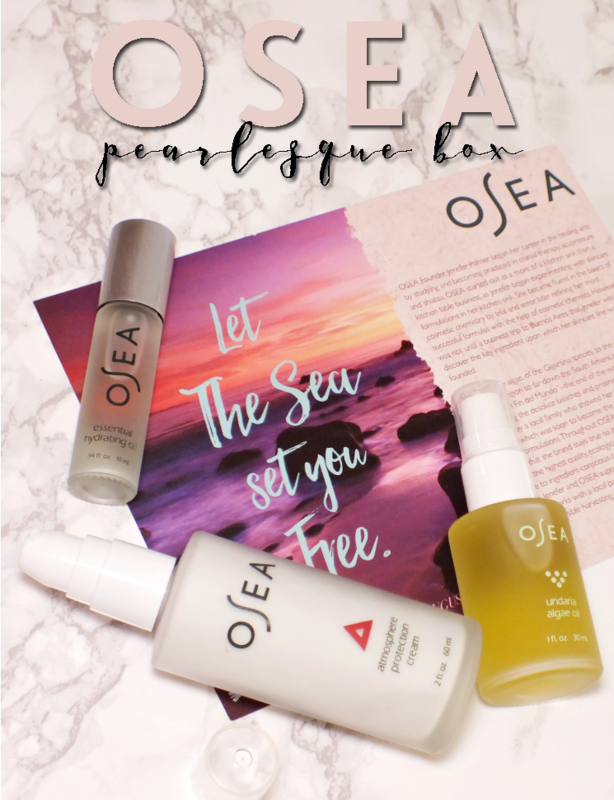 Never forgetting the source, jenefer and Osea also support ocean preservation, Heal the Bay, and works with a local partner in Argentina to ensure eco-responsible harvesting of their seaweed." 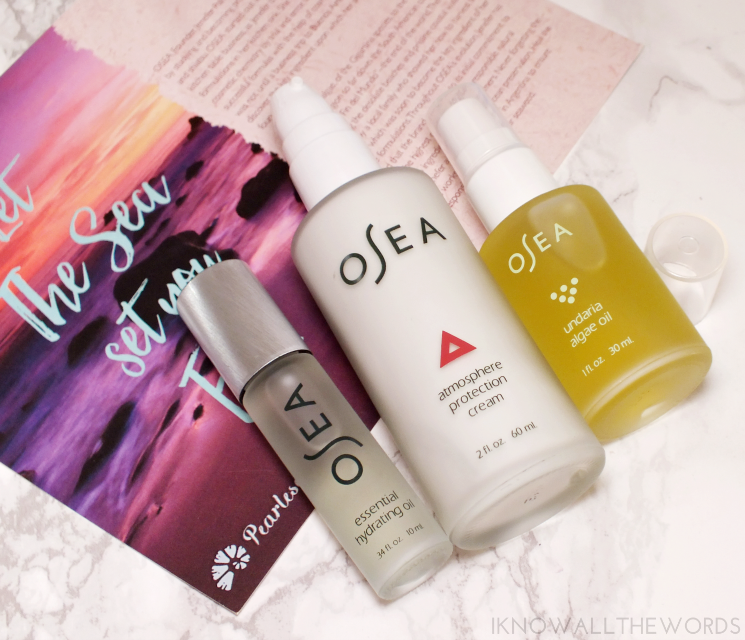 The August Pearlesque Box includes three Osea products, including a travel size Essential Hydrating Oil, and full size versions of their Atmosphere Protection Cream and Undaria Algae Oil. All of the products are housed in weighty, frosted glass bottles, with a super sleek, simplistic styling. Essential Hydrating Oil: an ultra hydrating botanical oil to skin. Featuring jojoba and sesame seed oils to deliver advanced hydration, the multi-use oil (face, neck, eyes, cuticles...) provides a dewy, radiance. Hydration and glow? Yes, please! Undaria Algae Oil: an ultra-concentrated, yet lightweight body oil with organic seaweed and botanicals (acai, babassu, passion fruit and sesame oils to be more specific) that works to deeply hydrate while firming and minimize the appearance of imperfections and stretch marks.With a citrus and cypres essential oil scent, this is a little bottle of pure heaven! Overall, products I'm really looking forward to using- I am in love with the scent of the Undaria Algae Oil! I love that Pearlesque Box aids in discovering something you may have otherwise never found. A monthly subscription to Pearlesque Box will set you back $39.95 (free shipping within the USA, international shipping is an additional fee.) You're pretty much guaranteed to get much more for your money- this month's box has a value of $96 USD. To receive this month's box, subscribe here by August 5th and use code BAILEY15 to save 15% on your first order. Pearlesque Box is now offering 3, 6, and 12 month options along with electronic gift cards that can be used in their store or on subscription purchases. What do you think? Do you or have you subscribed to Pearlesque Box? Tried anything from Osea?